ExpressVPN is a VPN service provider founded in 2009 and currently based in the British Virgin Islands. It operates a global network of VPN servers in 87 countries. Below, we review its salient features. More and more devices are now Internet-enabled. In addition to the computers and the smartphones of the world, consumer electronic devices, such as e-readers and media-streaming set-top boxes, also connect to the Internet. These devices are anything but homogeneous. Specifically, they run on different operating systems - Android, iOS, MacOS, Windows, Linux, just to name a few. The primary purpose for a VPN is to protect the online anonymity and privacy of its users. For a VPN to do its job properly, the aforementioned Internet devices must be able to connect to the VPN. VPN vendors typically provide client apps that you can run on an Internet device to configure and establish a VPN connection. Most vendors make available client apps for iOS, Android, and Windows through their respective app-store. If your Internet device runs any other operating system (e.g., Linux and MacOS), you need to configure the VPN manually using instructions on the VPN vendor's website. ExpressVPN distinguishes itself in the industry by providing native apps for more devices and technology platforms than its competitors. It provides apps for devices running Linux and MacOS as well as the de facto industry standard iOS, Android, and Windows. You will also find ExpressVPN client apps for your Chromebook, Nook HD, Kindle Fire, and BlackBerry smartphones (Priv and DTEK50). You can download ExpressVPN client apps to as many Internet devices as you want. But, you can only connect a maximum of 3 devices to the VPN at any time. Given that some of its competitors allow as many as 5 devices, ExpressVPN is underwhelming in this area. If you want to connect more than 3 devices at once, you need to buy additional licences from ExpressVPN. Alternatively, you can install the ExpressVPN client app on your router. A router counts as only one device, although you can connect multiple devices through it to reach the Internet. Circumvent the single user limit. ExpressVPN, like every other VPN vendor, disallows sharing of one's account with others. Account sharing violates the terms of service. The only legitimate way to circumvent this restriction is to install ExpressVPN on your router. In this way, your guests can be protected without having to buy additional licenses from ExpressVPN. Installing ExpressVPN at the router saves you the effort of installing it on each Internet-enabled device. The caveat is that you may still want to install the ExpressVPN app on your mobile devices, such as your smartphone. This is because you may connect to the VPN while you are away from home. You can get an ExpressVPN-enabled router in 1 of 3 ways with varying degree of technical difficulty. The easiest way, but also the most expensive, is to buy a pre-configured router directly from ExpressVPN. A more affordable option is to buy the same router from a third-party (say Amazon), and flash it yourself with the firmware provided by ExpressVPN. This solution is characterized by an intermediate level of technical difficulty. Be forewarned that flashing a device incorrectly can turn it into a brick. Finally, the most affordable but also the hardest option, assuming that you already have a compatible router, is to manually configure the router using the instructions on the ExpressVPN website. Our recommendation is to buy the pre-configured VPN router from ExpressVPN, if your budget allows it, and save yourself the headache of having to manually configure it. However, if you want to do it yourself, the ExpressVPN support team is an excellent resource. ExpressVPN operates from the British Virgin Islands which is located in the Atlantic Time Zone. North American subscribers benefit the most because there is minimal time difference. Others need not fret though because ExpressVPN offers 7/24 support through live chat and email. I was able to reach a support person via live chat at 3am, their local time. When you connect to the VPN, you are essentially connecting to a VPN server in the ExpressVPN network. The VPN comprises 136 VPN server locations in 87 countries. Some VPN server locations have more than 1 server deployed. So, which VPN server and server location should you select for the best performance? In general, you want to choose the VPN server which maximizes connection speed and security. Connection speed and security are affected by many factors. One major factor is the VPN protocol used to establish the VPN connection. OpenVPN is widely regarded as the top protocol for maximizing both speed and security. Unlike many VPN vendors, ExpressVPN supports OpenVPN on all its servers. Moreover, the ExpressVPN client apps default to using OpenVPN. As a result, you no longer need to explicitly consider the VPN protocol in your server decision. The speed of your VPN connection depends in part on the proximity between you and the VPN server. If you are located in the same city as an ExpressVPN server, you cannot go wrong by selecting that VPN server. Everyone else can run the ping speed test, provided by ExpressVPN, to rank the proximity to each ExpressVPN server. The ping test does not report bandwidth. A ping test tells you the time in milliseconds it takes for a data packet to travel round-trip between your device and the VPN server. It gives you an approximate idea of the distance between the 2 hosts. Yet, it does not tell you the bandwidth, i.e., how much data in Mbits can be transmitted per second. To measure the bandwidth, a third-party tool such as speedtest.net is needed. The ping test is not supported by all ExpressVPN client apps. You can run the ping speed test on Android, MacOS, and Windows. If the client app runs on another platform, say Linux, you cannot execute the ping test. Besides the ping test, the ExpressVPN client app has the following features to help you select a VPN server. It remembers your most recent selection. Your most recent selection becomes the default location the next time you open a new VPN connection. It recommends a 'Smart Location'. Despite the recommendation, you should still run the ping test to verify if the Smart Location is really the best choice. In my own tests, the recommended Smart Location is 3000+ kilometres away in another city across the country. The recommendation is puzzling especially given that my home city has an ExpressVPN server with better ping test results. In fact, the location with the best bandwidth is neither the Smart Location nor my home location. The best location, according to the ping test, is 200+ kilometres away in the adjacent country. You can save locations as Favorites. This feature is not available on all platforms (e.g., Linux). To evaluate the speed of a VPN service, there is no substitute for actually trying out the service yourself. Next, we discuss ExpressVPN's subscription plans as well as the money-back guarantee. ExpressVPN bucks the industry trend of offering a free trial of its services, typically 3-14 days in duration. Instead, it offers a 30-day money-back guarantee for all its subscription plans. Other vendors may have similar money-back guarantee but a total refund is usually conditional on you using less than a bandwidth threshold which ranges from 2 to 10 GB of data transfer. 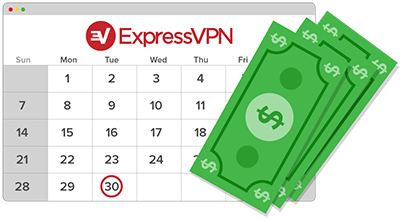 With ExpressVPN, you get all your money back, no questions asked, regardless of how much bandwidth you consume in the 30-day period. A total of 3 paid subscription plans are available for purchase. The most popular plan, which is also the most affordable, is their 12-month plan for $8.32 (USD) per month. If 12 months is too long for you, you can get the 1 or 6-month plan at higher prices. When you are ready to purchase, the checkout page gives you 20 different payment options. Among them are the major credit cards, PayPal, and Bitcoin. Bitcoin is the de facto industry standard as a payment option because you can purchase and make payment in bitcoins anonymously. Interested readers should refer to the excellent Bitcoin payment guide prepared by ExpressVPN. ExpressVPN is not the most affordable VPN service in the industry. 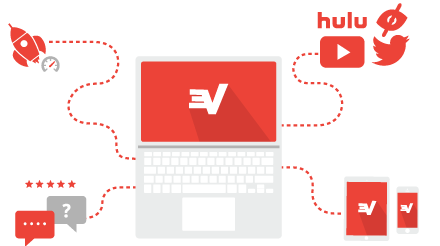 However, if you have a multitude of devices to protect, you should consider subscribing to ExpressVPN. More likely than not, you will find a VPN client app that you can download and run on your Internet devices. Excellent platform support for VPN client apps. 30-day, unlimited bandwidth, money-back guarantee. Only 3 devices can connect simultaneously.